Special 7-1 is the first level of Special 7 in Super Mario 3D Land. It is based off of World 3-4. 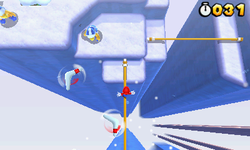 The player starts off on a snowy platform with a Roulette Block and some horizontal ropes in front of them. The Tightropes lead to another platform with a Roulette Block on it and a platform with a Warp Box on it. In the next part of the level is a rope, with some Brick Blocks and a ? Block containing a Starman on it, that leads to a small platform with some Boomerang Bros. on it. Next to the platform is another rope that leads to a Warp Box. In the next area are more tightropes. After ascending them, the player will find a platform with a Roulette Block on it. Next to this platform are some more ropes that lead to a Warp Box that leads to the final area and the Goal Pole. Star Medal 1: The first Star Medal is behind the tree near the start of the level. Star Medal 2: The second Star Medal is floating on a platform next to some ropes. Star Medal 3: The third Star Medal is on a Rubber Platform just before a Warp Box.